The Food Alphabet and More: Great Food! Chow Fun! 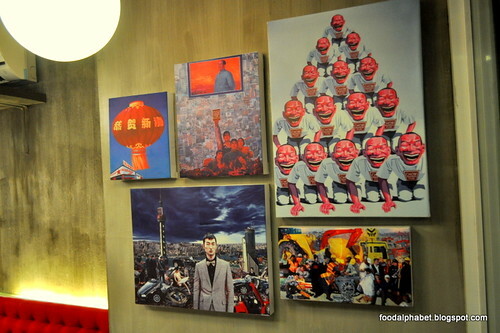 We may have dined in a quite a number of restaurants in the metro through the years, but nothing has prepared for this one of a kind Chinese fusion restaurant, mixing a bit of culture and modern tastes, a posh atmosphere, making this food experience as fun and delicious as it can possibly be. 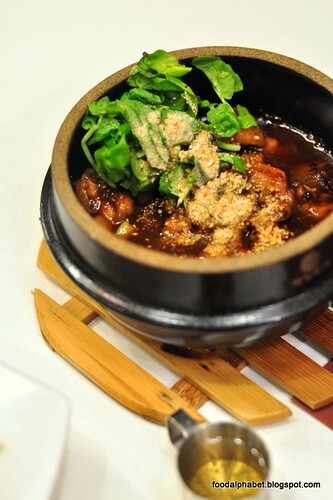 A perfect blend of seafood balls, squid and vegetables, deep fried to a crisp and given the choice between 2 fondue dips, namely Cheese and Curry / Spiked Sweet Chili. 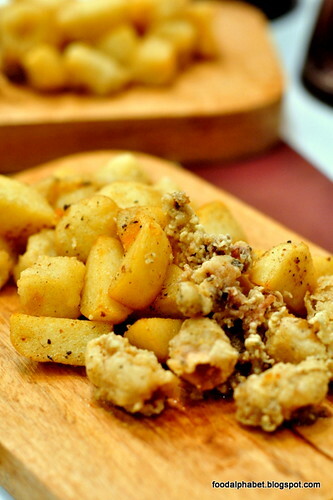 I had a lot of fun munching on these delicious wonders, it's like calamares bites but this is definitely more, this appetizer alone is reason enough for me to come back for more. 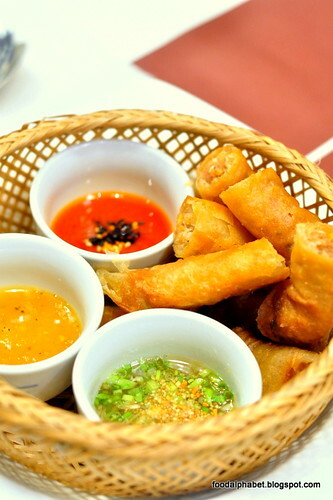 There's also the Oriental Duck Rolls (P165), which are duck-filled fried spring rolls, served with 3 sauces for you to choose from. A modern alternative to the usual Peking duck roll. 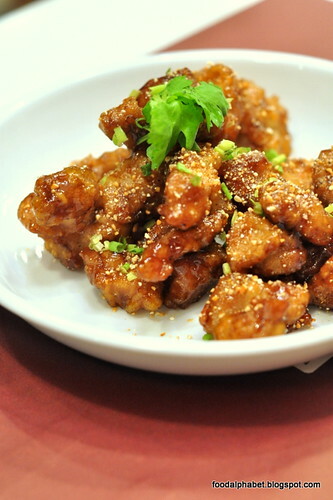 The Sour Caramel Pork (P255), Chow Fun's rendition to the traditional sweet and sour pork, fried to taste, dipped in vinegar, then glazed with sweet caramel sauce, every meaty piece promises to give you that full flavor of pork goodness with a tad sweetness. 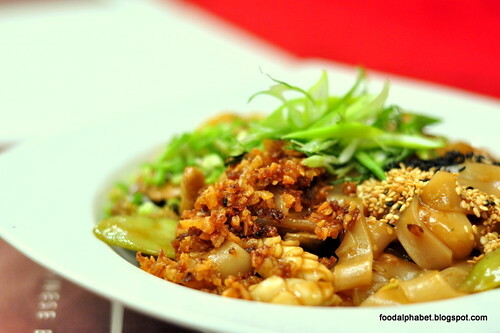 A break from the traditional birthday noodles that we usually have in other Chinese restos, this definitely brings out the best in Chow Fun. As others may have said, if they can't do noodles properly, then there is nothing else they could do right. 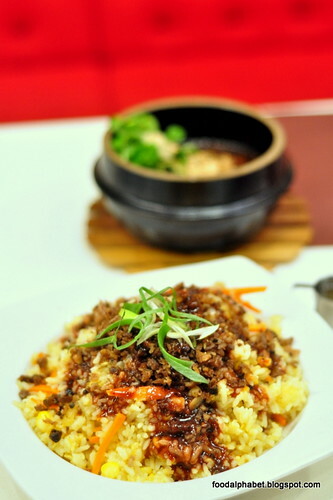 How about trying Fried Duck Rice (P240). 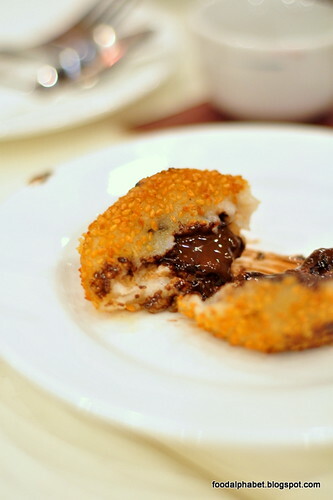 A signature fried rice of Chow Fun, makes a welcome addition to their inspiring menu. 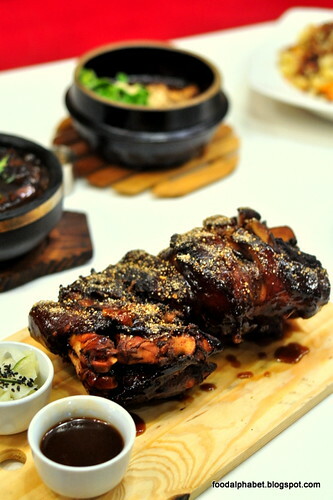 Beer Chicken (P235), you add beer literally to the chicken pot dish to add flavor to the mix, taken inspiration from the traditional 3-cup chicken which uses rice wine to bring about the flavor, it's something unique that you should at least try once in your lifetime. Leg of pork brined, braised, slow cooked, and deep fried once more with house pickles on the side. 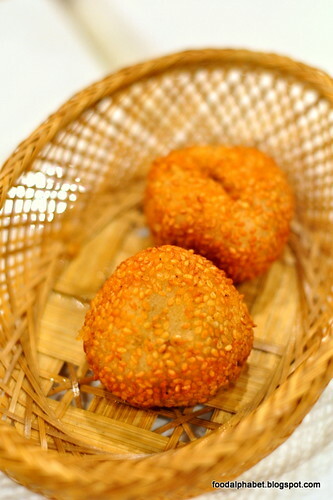 There is no need to introduce the Pata tim, as this has been a favorite house hold treat to every Filipino or Chinese family. 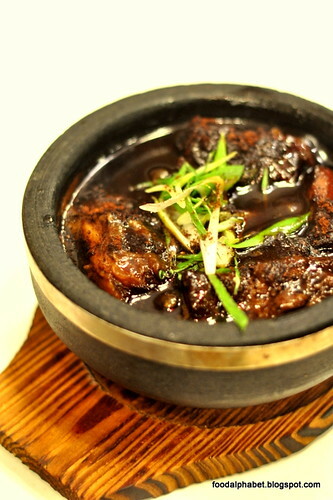 Beef short-plate stewed in coffee and cooked with Chinese spices and seasonings. Perfect with white rice. Franny's favorite, and I would say, I couldn't agree more. 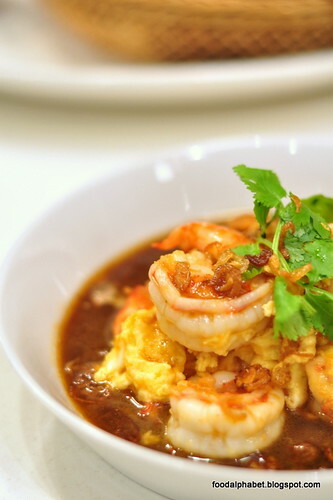 These babies are so enticing and so tastefully crafted to bring out the sweet juicy goodness of fresh prawns. 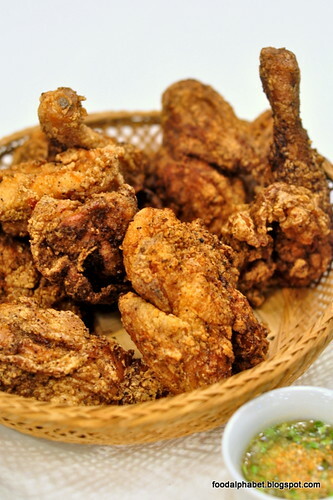 Somehow reminded me of the fried chicken we ordered in Taiwan, served crisp fried and tender to every bite as I was expecting it to be salty, it turned out sweet to fit the Filipino taste. We had quite a few desserts with Haw Flakes pastry (P85) and their signature ice creams, but what caught my attention was their Dark Chocolate Butchi (P115), I am a butchi fan myself and just thinking of the premium dark chocolate oozing from every bite of my butchi, ooohhh, I'm literally salivating and craving for some. 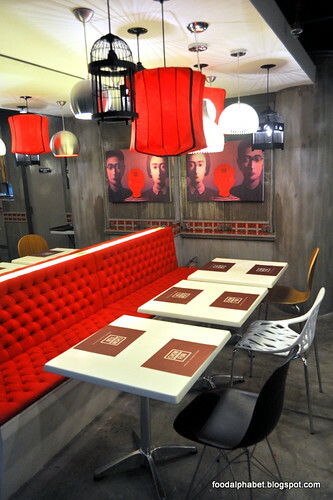 Enjoy the sights and sounds of Chow Fun, with its unique setting, a different kind of Chinese menu and an gastronomical experience only Chow Fun can offer you. 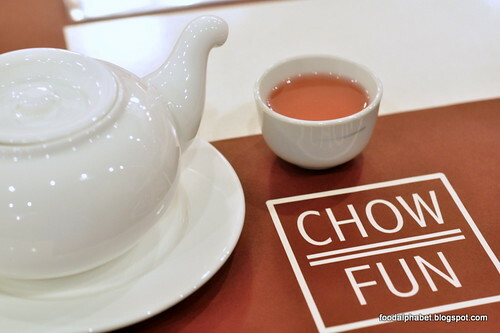 Visit Chow Fun along J. Abad Santos in San Juan, and feast on a delicious treat of sights and flavors. Try them out and tell me what you think? in this i'll always learn something new in recipes.i always try these dishes at home and enjoyed with my family members. Got to love Angry Puffs! Twister fries is back at Mc Donald's!